Watch in silent horror as this decently big Armas ferry decides to turn left, almost immediately crashing through the massive concrete barrier of a harbor and spilling rubble onto the roadway. There’s not much information available from the video, and for some reason the sound is cut out until the very end, after the boat has already gotten its bow snuggled nicely through a few feet of concrete. 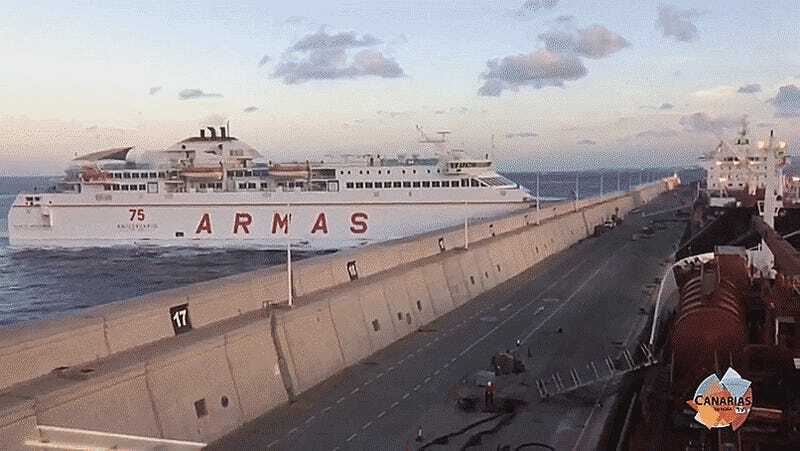 Nobody was reportedly injured in what has been labeled a “freak accident” that involved the, uh, ferry turning left at, uh, high speed... right into a you-can’t-miss-it-big harbor wall of Las Palmas de Gran Canaria, a Spanish island in northern Africa. How long until the memes occur?